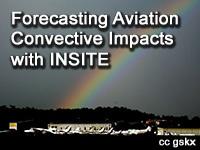 The National Weather Service (NWS) has developed the INSITE tool (INtegrated Support for Impacted air-Traffic Environments) to improve NWS convective impact forecasts by providing functionality that enables forecasters to include more precise impact areas in aviation convective weather forecast products. The tool lets forecasters identify potential constraints to the National Airspace System by combining forecast weather and air-traffic data. Improved convective weather forecast products can reduce delays in air-traffic and increase efficiency in the National Airspace System (NAS). In this 45-minute lesson, we follow an approach for using INSITE from a national and a regional-level perspective. The domain of the INSITE tool is currently limited to CONUS, the Great Lakes, adjacent coastal waters, and nearby airspace to the north and south. Very informative. A good tool to have in your arsenal if you brief pilots. The website itself provides a very good first glance at convective potential/trouble zones for flying. For some reason website wasn't working on my computer and I wasn't sure if it was due to browser or browser settings. This course has helped me navigate and understand the parameters of INSITE. This module is excellent, however, the tool itself is too complicated to operational users, given the results are based on different models and have current and historical perspectives. How do you want user to make a decision based on these? I enjoyed this lesson a great deal. Weather is a hobby for me so I did not expect to be able to master some of the complexities of this lesson. However, I learned a great deal and it was fun and interesting. Highly recommended for the non-professional! Recall and describe the elements that can be displayed on the map view panel (i.e., NWP synthetic radar display, constraint heat map, airways, airports, and ARTCCs). Navigate the INSITE tool to select and display products (NWP model/time/location/altitude, observations, constraint heat maps). Describe how convective constraints are derived in CC bars and heat map. Recall and describe the elements that can be displayed on the Constraint Overview panel (i.e., convective constraint (CC) bars). Use the INSITE tool to view and edit CC bars for Air Route Traffic Control Centers (ARTCCs), INSITE-generated Alert areas, and user-generated polygons for different NWP products. Interpret the CC display to determine the severity of the convective constraint at a given time, location, altitude, and airway (i.e., flight path). Edit (filter) the flight path constraints. Interpret the CC display to determine the forecast confidence. Describe how that forecast confidence is derived for Synthesis and NWP model products.